OMG what has happened to the drivers in this country who are parents? How many times do you see children without a seat belt jumping up and down in a car, standing with their back to the front windscreen, standing up with half their little body showing through the sunroof, or standing between the mum and dad, who incidentally are wearing seat belts. Don’t parents believe in parenting any more? Even those nationalities where seat belts have been mandatory for years seem to think it’s ok to drive a car (basically a lethal weapon when you think about it) without everyone wearing a seat belt. Stupid or what? Parenting means looking after your children physically as well as emotionally and the whole gamut in between. All it takes is one split second for an accident to happen. Granted it might not be your fault but it is your fault if you and your children aren’t sitting down with seat belts to protect you and your family from even greater physical damage. The mental anguish of an accident is something none of us should ever have to bear but accidents do happen. We should, at the very least, be looking after the precious lives of our little ‘uns. Why do we think everything is indestructible, that we can ride out any storm, that these things will never happen to us. Never is either a long way away or it is on our doorstep. Be an adult. Act in a caring and responsible way. Seat belts aren’t added to cars just for fun. There are serious reasons for seat belts and the main one is protection from severe injury or even death. You can look up the damage done to little bodies when they are not in a child car seat or restrained by a seat belt on the internet – just google a few words relating to unrestrained children in car. We’ve searched through and found a few which should make you think twice and if you don’t then you’re possibly heading for a miserable future. It doesn’t stop at children. Adults should also wear seat belts as there can be untold damage to the occupants by a vehicle hitting another vehicle even at speeds of less than 50 kph. If the occupants aren’t wearing seatbelts their bodies are thrown about within the car causing injury/further injury to passengers who may or may not be wearing a seat belt. Just think about it. The Dubai RTA’s Light Motor Vehicle Handbook states ‘Crashes do happen. The crash rate for Dubai is very high’. Make no mistake about it accidents can and do happen over which you have little control. You do, as with everything in life, have control over the possible outcome by considering the possibilities. Wear a seat belt, regardless of whether you are sitting in the back or the front of the car. It is also mandatory to use a car seat/booster seat for children below a height/weight where a adult seat belt could be used. 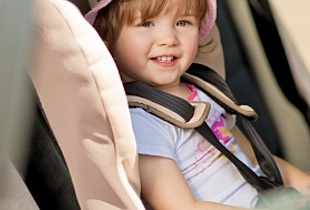 Check this pictorial guide for car seat usage – scroll to the end of the article. The driver of the vehicle should ensure all passengers are wearing seat belts. Be a grown-up and consider the little guys and yourself of course! So, everyone, in any vehicle, anywhere, at any time, must belt up.